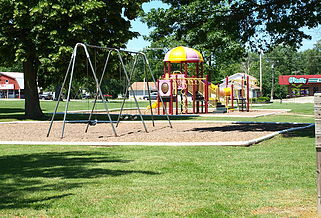 The city of Eldon has 4 parks and 11 playgrounds. There are also baseball and soccer fields and a skate park. Rock Island Park - Known as the Healthy Hub of Eldon, is located in the center of town right off of Business Hwy 54. Rock Island Park has a pavilion with restrooms, walking trail, adult exercise equipment, 2 BBQ grills, 2 playgrounds, 3 swing sets (including 1 expression swing and 3 special needs swings), a merry-go-round and a jungle gym and plenty of picnic tables and benches to relax and enjoy the park. Rock Island Park's Pavilion has two sides that are available for rent in 4-hour blocks. Rate: $25 per side, $25 refundable cleaning fee deposit per side that is rented. The Airpark has 2 pavilions, restrooms, a walking trail, basketball courts, a skate park, a large playground, 1 swing set, 2 horseshoe pits, 18 hole disc golf course, a gazebo, a sand volleyball court, 2 soccer fields, and 3 baseball fields. There is also a Military Nostalgic Tank on display. Located west of the Eldon Airport off of Franklin Street and adjacent to the Eldon Aquatic Center.The Airpark Pavilions are available to rent in 4-hour blocks. Each requires a $50 refundable cleaning fee deposit. The rental charge is $25 for the large pavilion and $10 for the small. Wilson Park is located off South Grand. Wilson has 1 pavilion, a jungle gym, basketball court, 1 swing set, and 1 playground. This park is in the process of being renovated. Renovation will be completed by Summer of 2019!! Located south of town off Chestnut. Apperson has 2 baseball fields with a pavilion-covered concession area, a playground with a swing set. This park is very popular for hosting youth baseball and softball tournaments. McMillan field is located by South School. It is a full-size baseball field with mound, batting cages and bullpen areas. There is also a concession stand with an eagles nest on top for announcing and score-keeping.